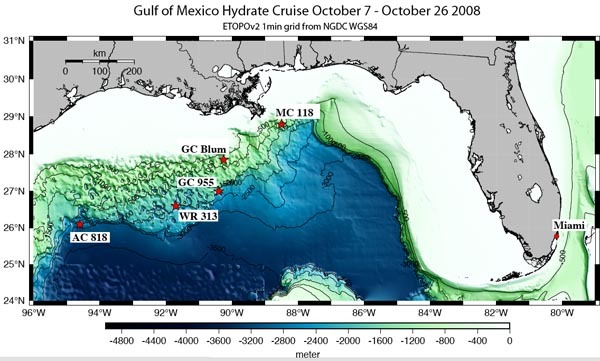 Building on our pilot study over Hydrate Ridge, this project surveyed four areas in the Gulf of Mexico (MC 118, GC 955, WR 313, and AC 818) using much improved CSEM methodology. First proposed in mid-2005, this survey has had a long gestation for various reasons, but finally went ahead in October 2008. 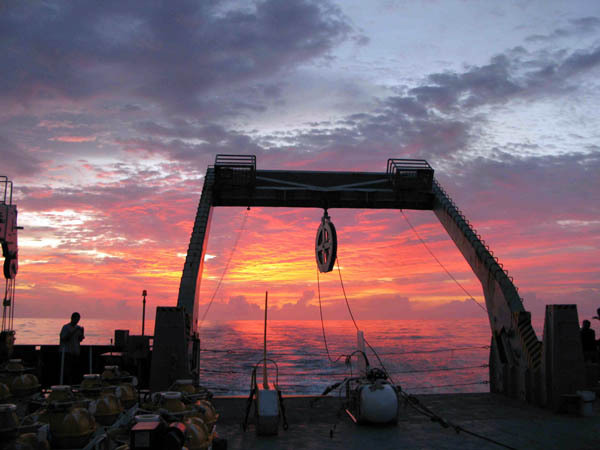 Funding for this work came from DoE/NETL, MMS, UC Shipfunds, Chevron, ExxonMobil, WesternGeco, EMGS, Fugro, CGG/Veritas, Statoil, and Shell. October 23, 2008. 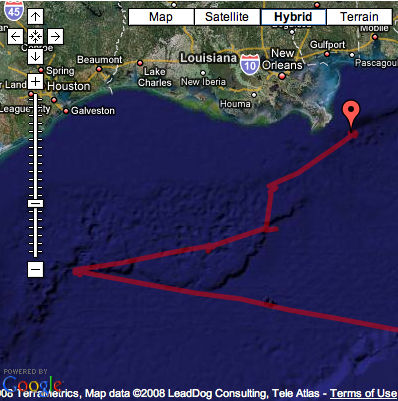 Here's a map of the ship's track around all five survey locations. October 22, 2008. 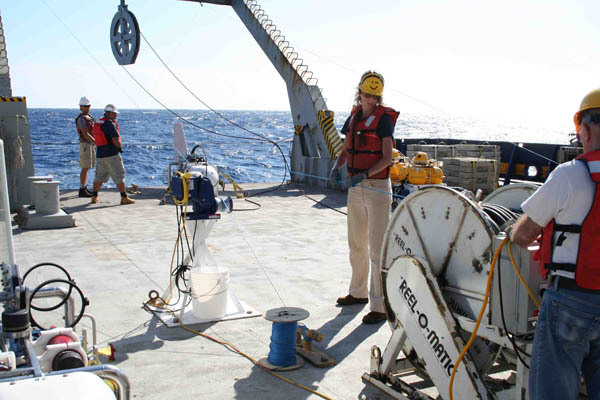 Steve Reese, John Souders, Arnold Orange, Chris Armerding, and Karen Weiteyer looking appropriately bored as we run the sixth tow line over the MC118 survey area. Arnie is controlling the winch. October 20, 2008. 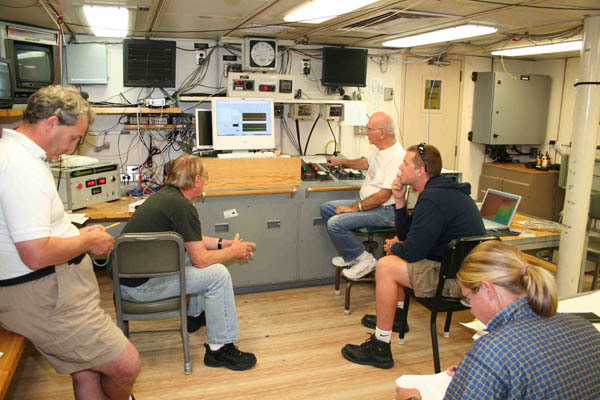 The main deck during the multibeam survey, when all the receivers are on board. Some of the things we've been talking about have been labeled. The electrode arms are stored upright in plastic bins on the port side of the ship to the right of the photographer. The famous barracudas are stored under cover. October 19, 2008. Paying out line between Vulcan and the SUESI antenna, just before SUESI's deployment this afternoon. Nice weather! October 17, 2008. The cruise logo! This cruise almost happened in the summer of 2007 but was delayed at the last minute by bureaucratic matters, hence the modified logo. October 16, 2008. 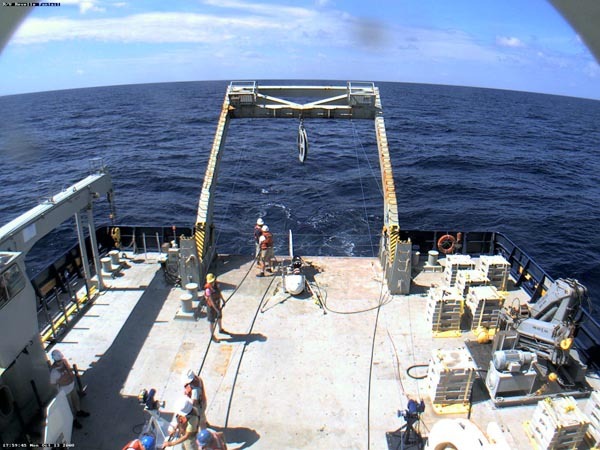 Here are two photos of SUESI #1 (Scripps Undersea EM Source Instrument). As discussed in Steve's diary, SUESI #1 is a happy transmitter and has been performing well. 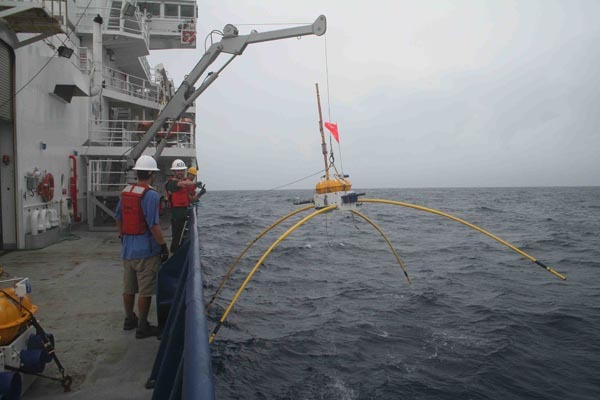 The cruise has now completed two hydrate surveys (AC818 and WR313.). October 14, 2008, Part II. They've arrived at Walker Ridge 313 and deployments are to commence shortly. 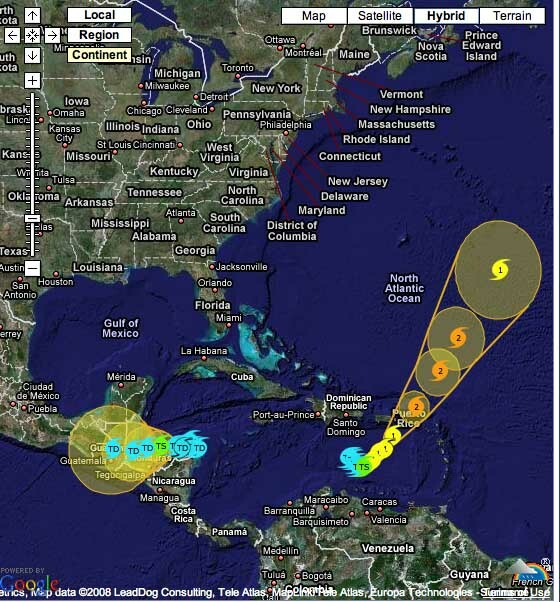 The second map shows the predicted paths for two tropical depressions and Hurricane Omar. 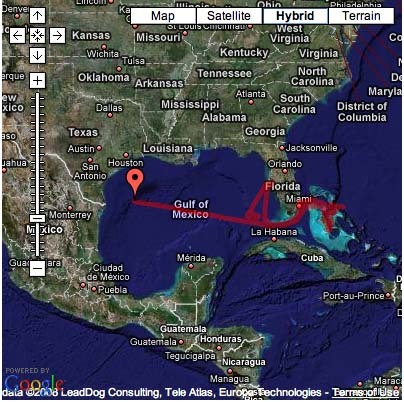 Looks like the remainder of the Hydrate cruise should be okay, but I wouldn't want to be in Puerto Rico. October 14, 2008, Part I. Here are two images Steve emailed from the ship. 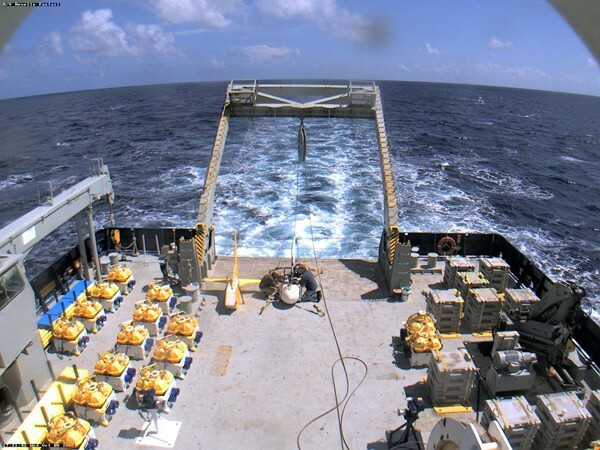 The first image is the towed 3 component EM receiver "Vulcan" being deployed through the A-frame. 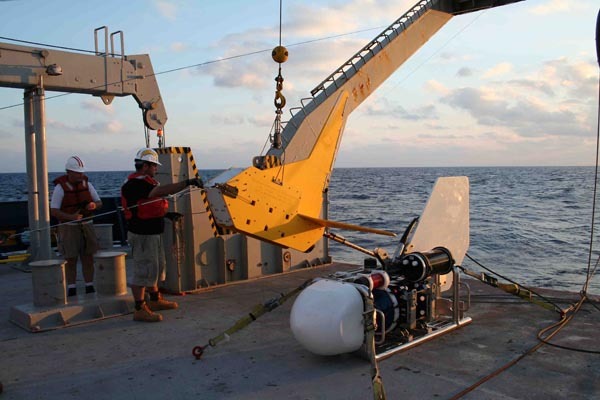 The second image is a 3 component seafloor receiver being recovered. The long yellow arms contain silver-silver chloride electrodes at their ends, and the horizontal electric field is recorded as the potential difference between pairs of the arms. The shorter vertical pole is for measuring the vertical electric field. The short blue tubes attached to the instrument frame contain induction coil magnetometers that record the time varying magnetic field. October 13, 2008. Looks like the survey at AC 818 is finished. 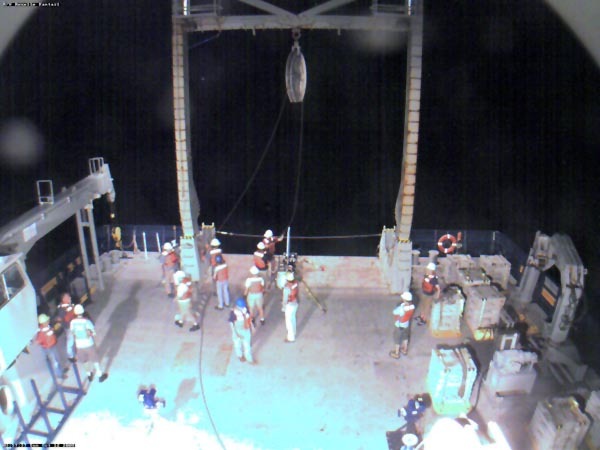 SUESI is back on deck and the team is recovering the transmitter antenna cable, then they'll have to pull Vulcan out of the water. October 12, 2008. Nighttime operations with SUESI being deployed through the A-frame. 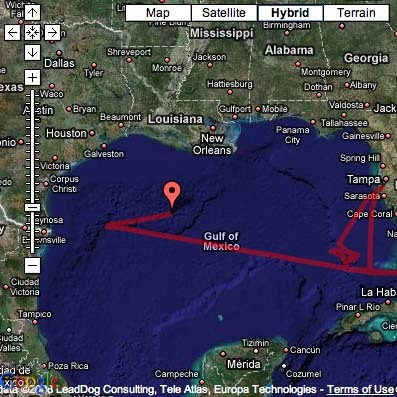 Read Steve's cruise log diary to learn more. Click here to watch a movie sequence of the SUESI and Vulcan deployment. October 11, 2008. 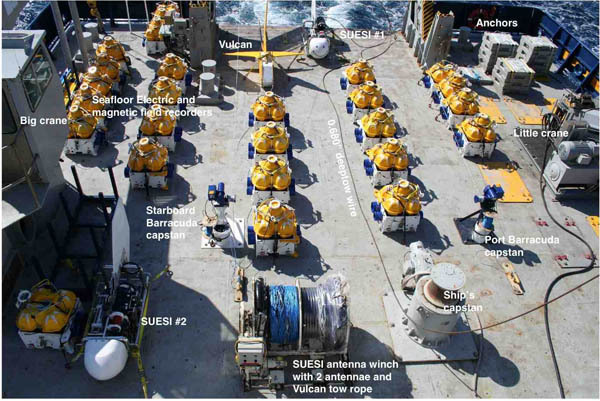 Compare this to October 8––all the receivers have been deployed to the seafloor. Click here to watch a 24 hour sequence of images from this HiSeasNet camera. October 10, 2008. The Revelle has arrived at Alaminos Canyon 818. October 9, 2008. 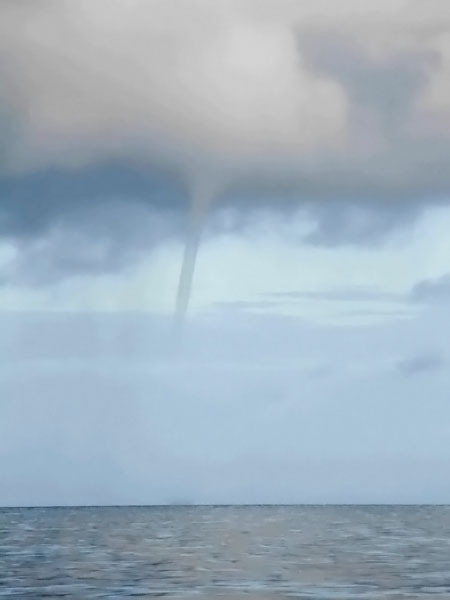 Sunrise and a water spout photos, both taken this morning by Alex James. October 8, 2008. 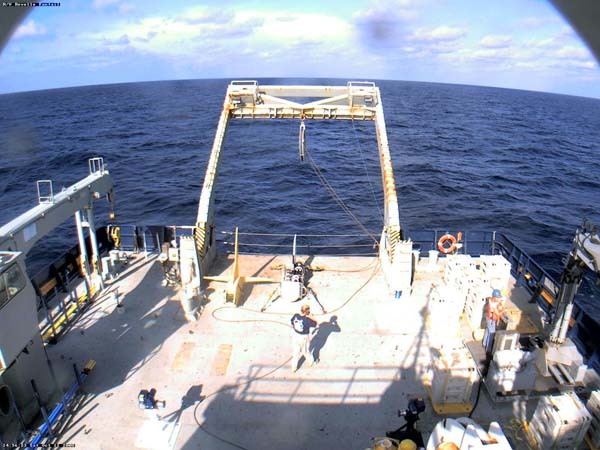 R/V Revelle in transit with a full deck of EM receivers, the SUESI transmitter, the Vulcan towed receiver and stacks of concrete anchors. 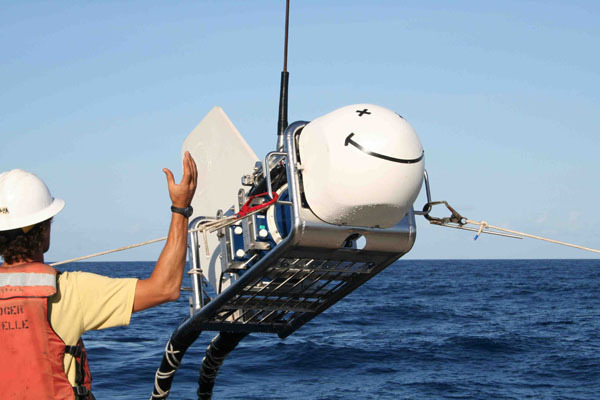 Steve Constable and John Souders are on deck testing the EM transmitter SUESI.